Upon my recent return from Lebanon, I wrote a letter in the March aeqai in which I spoke of the prevailing creative energy I found there, a creative energy that permeates everyday life. In it I also gave a review of the art show “Sifr” by Lebano-Senegalese artist Hady Sy whose work focuses on the “null”, yet corrupting value of money that controls all of our life. In this edition I would like to report on another aspect of the lively visual arts scene in Lebanon, namely the “32nd Salon d’Automne”, a collective juried art show which was held from November 2016 until February 2017 at the recently renovated Sursock Museum, in Beirut. 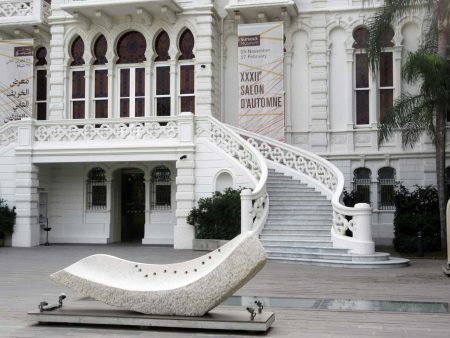 The Salon d’Automne has been in existence since 1961 when the Sursock Museum first opened its doors for art exhibits. Initially annual, this event, which is borrowed from the historic Paris Salon, takes place every 2 years. It uses an open call format and provides an opportunity for all artists living in Lebanon to share with the public samples of their latest work in the medium of their choice. Over the years, the Salon d’Automne has reflected progress, new trends and new shifts in art creation in Lebanon; helped discover new local emerging artists; and provided a forum for discussion on the state of the visual arts in the country, involving artists, art critics and the art audience at large. At every Salon, a Jury committee, composed of notable artists, art critics, art curators and art historians, reviews all the artworks submitted, selects the ones to be included and awards prizes to some of them, specifically the Sursock Museum Prize for the most innovative work, the Emerging Artist Prize for the most promising early career artist, and this year, for the first time, the Audience Choice Award. This approach of the jury was different from that of previous years’ and as a result many well established artists who were included, and even awarded, in previous Salons were excluded this time. 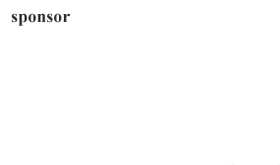 This, of course, created an upset reaction from them, as well as from some of the visitors and traditional art critics. I personally found the selection displayed to be well balanced, one which gave a good idea of the current and evolving status of contemporary arts in the country. I resonated with many of the pieces chosen, due to their various combinations of technical ability, exciting and relevant imagery, strong emotional feelings,and/ or personal messagery even when not immediately obvious. 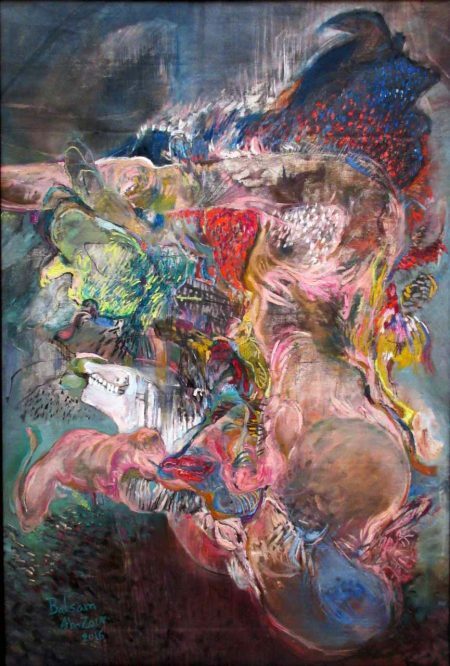 The Sursock Museum Prize was awarded to Abed Al Kadiri, a painter in his early thirties. 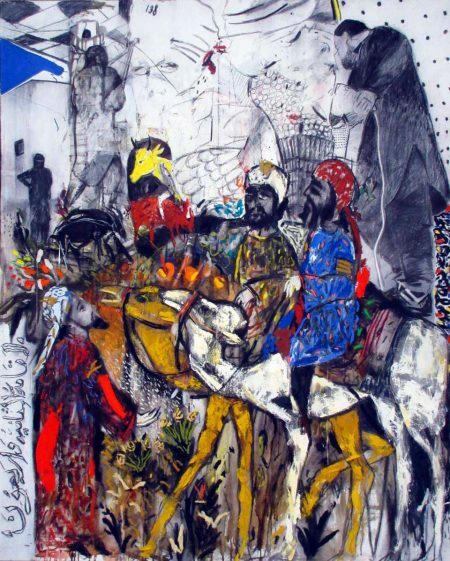 Al Kadiri’s charcoal and oil painting “26th of February 2015”, carries for its title the date a video was posted online in which ISIS was shown destroying statues and ancient artifacts at the Mosul Museum, in Northern Iraq. It is inspired by ‘Maquamat Al Hariri’, a book from the 11th century that contains fifty short stories (maquamat), each illustrated by a typical Arabo-Islamic miniature image. Al Kadiri vaguely replicated, in large format, the iconic image of the 42nd maquamat (as mentioned in Arabic writing at one edge of the painting) adding to its background silhouettes of individuals destroying statues, therefore and indirectly Arabic civilizations. Twenty seven year old artist Dala Nasser was awarded the Emerging Artist Prize for her mixed media piece “David Adjaye’s Trash”. Raw, yet sophisticated in its concept, Nasser’s work makes a strong statement about the daily contradictions in which Lebanese find themselves in a world of increasing disparity and for some, of reckless indifference. David Adjaye, the renowned Ghanaian British architect, did the design for the costly $100 million building of the Aishti Foundation which houses a museum/exhibition space for contemporary arts, in the suburbs of Beirut. The luxurious building was being erected at the same time as Lebanon was experiencing a long term trash crisis with its streets piled up with mounds of garbage. 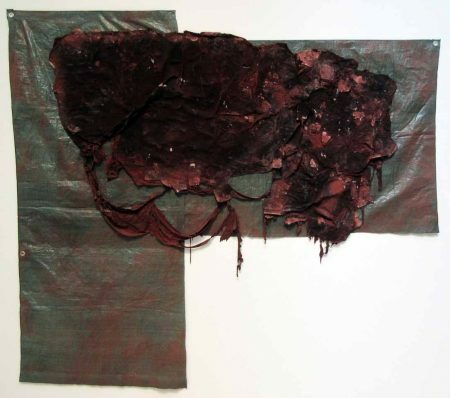 This contrast could not escape Nasser who managed to collect trash from David Adjaye’s studio, mount it on a tarpaulin, thicken it and stiffen it, and paint it dark red, the color of the red ceramic tiles covering the facade of the Aishti building. Her piece, representing a decaying hanging structure, alludes directly to the trash crisis Lebanon was experiencing, but indirectly and more importantly to the decaying values the Lebanese society was experiencing daily. It had become Nasser’s political and awareness call. 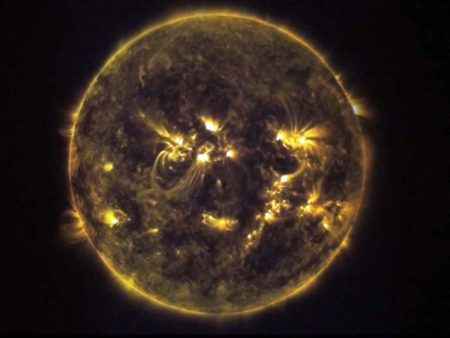 In his “40 days of mourning” video, 28 year old Marwan Moujaes uses moving images taken from NASA to depict the solar activity of the 40 consecutive days, from August 21, 3:15 am until October 3, 3:15am, 2013. August 21, 2013, 3:15 am is believed to be the time when the Assad Syrian regime dropped chemical weapons on the Ghouta area, near Damascus, thus killing more than a thousand individuals. Moujaes’ piece references the 40-day memorial period, of major significance in Eastern Orthodox traditions, during which the soul of the departed is thought to continue wandering around before totally leaving the Earth. His images are gripping and somber, reminding the viewer of the cruelty of men and of the tragedy of death. The same ominous feeling is found in “Overflow”, an oil and acrylic painting by Ghada Zoughby. Zoughby’s image is of prominent red cloth bags (?) filling and overflowing 2 drawers, in a dark somber background. The overall atmosphere is striking and gloomy and one cannot but think of body bags or of images of the Holocaust depicting drawers overflowing with human skeletal remains. Violence and guns find also their way into Carmen Yahchouchy’s photographs and in Maria Kassab’s mixed media on paper piece. Yahchouchy’s “Victoria” and “Victoria’s One” pictures show, in the first, a woman, presumably a mother, holding a revolver, and in the second, the revolver resting on her bed. Guns have now penetrated motherhood and family and have become an intimate part of life, making violence justifiable, even the norm. 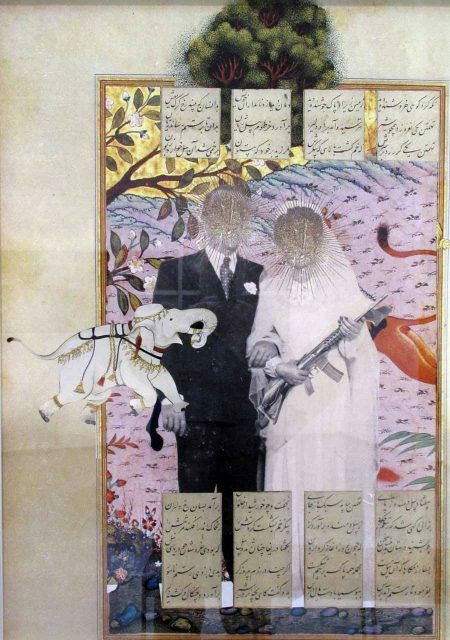 The same is depicted in Kassab’s mixed media on paper “The Last Triumph” in which a newlywed couple is represented faceless, the bride holding a gun, and the background, an Arabo-Islamic miniature. Kassab is thus making a statement about violence infiltrating and defacing our culture, firearms and killing becoming like guests of honor. The violence depicted is not only directed at humans but also to their environment and their physical world. In “Conversation with My Friend”, the Engram Collective illustrates in several photos and videos the ecological disaster happening all over Lebanon, often in residents’ own backyards. 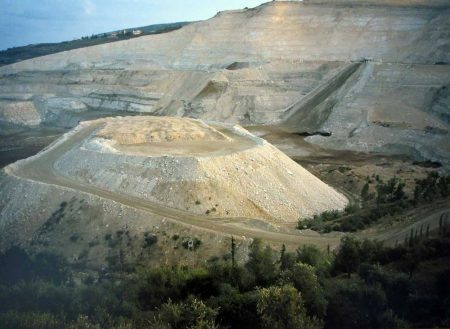 Their pictures show nature being raped and destroyed, the landscape scarred and industrially transformed, its greenery crushed and replaced by mounds of dirt and rocks, with sterile paths leading nowhere. 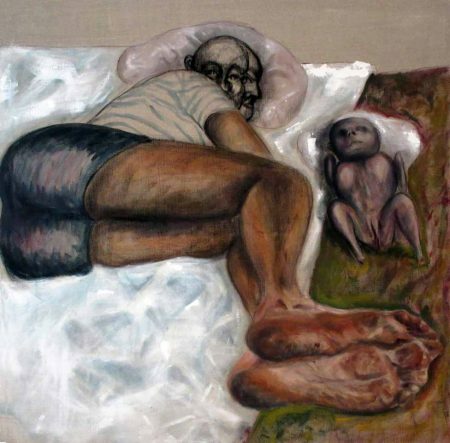 Dina Halabi’s “Newly Born,” a disturbing mixed media painting, shows a newborn girl with no hands or feet, abandoned on the floor, separated from and with no physical contact with an ambiguous female form, presumably her mother, lying down on a mattress next to her. To me it represents a strong statement about the often condoned powerlessness of women in many parts of our world, from the first moment of their births. 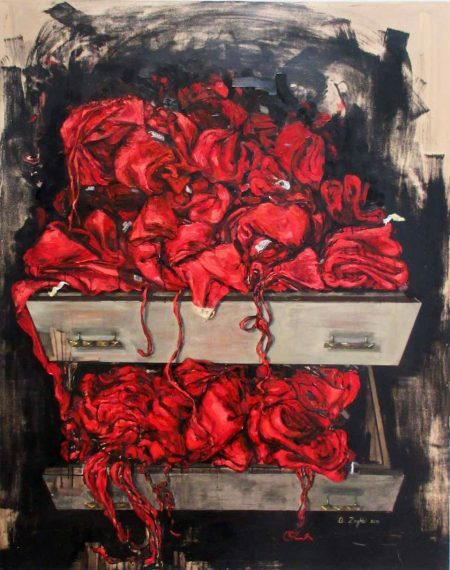 Halabi’s message is complemented by that of Simon Mehanna’s mixed media painting “Those whom we stripped of the right to dream, have yet to enjoy the right to an idea. Only the right to an idea would do them right” which represents a somewhat emaciated naked man contemplating a folded paper in his hands, reminiscent of a paper airplane symbolizing dreams. Is it Mehanna’s reflection on the fragility and vulnerability of man from whom society has taken away the basic rights, even those to imagine, to think, and therefore to prosper and be fulfilled…? 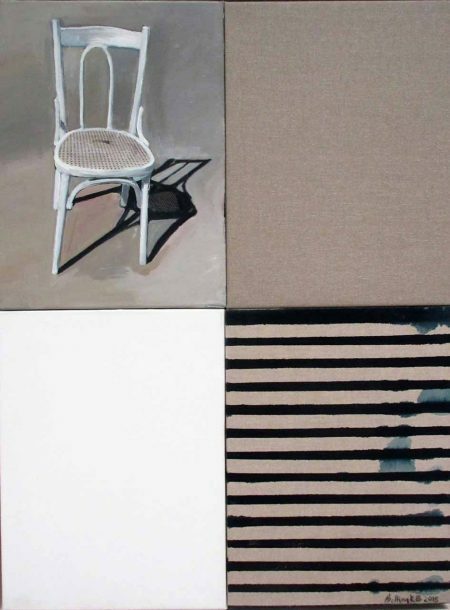 The theme of solitude and of brokenness of the human being in our society is also represented in 2 pieces depicting empty, vacant and isolated chairs. Jacko Restikian’s “Death Among Kinfolk Is Slumber”, is of assembled broken chairs which were left outside and had slowly deteriorated with time; and “Still Life”, a mixed media painting by Betina Khoury Badr, is of an isolated, free standing, empty and well lit chair begging for interaction in an otherwise deserted, fragmented and somewhat desolate environment. Not all the exhibited works, however, were gloomy or desperate. Edgar Mazigi added somewhat needed hope through his colorful acrylic painting “The Pond”. 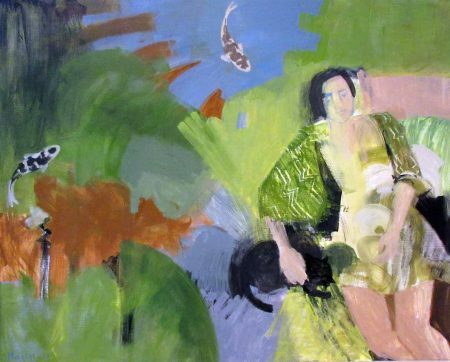 In it Mazigi represents a woman lying down, floating in an idyllic setting. She is holding a cat and is surrounded by water, plants, greenery and fish. She must have been restored her right to dream, and is relaxing freely in harmony with herself and her surroundings. That’s how we should all be, Mazigi seems to be stating. The works displayed at the 32nd Salon d’Automne were overall challenging and strong. Many of them brought us back to ourselves, to our condition, to our living rights or lack of, to our environment. It was refreshing and uplifting to hear the voices of so many talented young and less young artists living in Lebanon who, each in their own way, were making statements about life. It will be great to have a similar event held here annually in Cincinnati, Ohio, the city where I live. It will surely bring the community together; encourage artists to aim for their best, share their message and become known. It will also add resonance and meaning to the daily life of our city.